Would you like to add quotes that can make you money to your website? If Yes, then read on. I came across a great new plugin iand i just need to let you see in action. 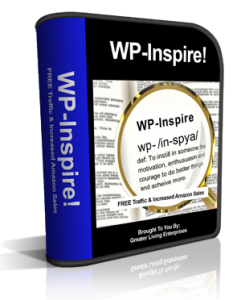 It is called WP-Inspire. WP-Inspire pulls a random Inspirational and Motivational quote from a text database of quotes. The quotes are inserted at the bottom of your blog posts and are monetized by an Amazon Search for the quote’s author using your Amazon Associates ID. The quotes are fully Search Engine Optimized for extra traffic from people searching for famous quotes. WP-Inspire is in use on my other website Money Management Tips; just take a look at the bottom of the pages.